For admins, bioPDF is simple and flexible to adapt and deploy, with support for unattended setup scripts, Citrix Metaframe, and more. End-users find the PDF writer fast and intuitive to use, emboldened by the fact that the interface is localized into multiple languages. This leads to swift adoption and low support requirements. When all users can and do print to PDF, fewer potentially harmful or unreadable file formats are distributed and paper use is greatly reduced throughout the organization. 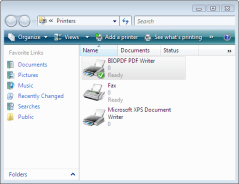 bioPDF takes highly praised community software Bullzip PDF Printer to the professional level. Over time, countless dedicated Bullzip fans have tested almost any conceivable combination of application and platform. Many more have simply used the application and reported their enjoyment. As large enterprise clients began to show interest, we developed bioPDF to match the requirements of businesses on any scale. We invite you to install and test bioPDF for yourself today at no obligation. Afterwards, you will find our registration process as reasonable, simple and hassle-free as the application itself. The bioPDF PDF Writer works as a Microsoft Windows printer and allows you to write PDF documents from virtually any Microsoft Windows application. Print to PDF from almost any Windows application. Control settings and prompts programmatically. COM/ActiveX API interface for programmatic control. Microsoft.NET API and command line API. Create BMP, EPS, PS, PNG, PCX, JPEG, and TIFF files as alternative to PDF documents. Create linearized PDF files for optimized web viewing. 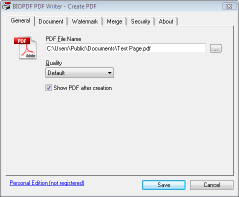 Create one PDF for all pages or one file per page. Individual horizontal and vertical resolution for image creation. Configure text and graphics alpha bits to support smooth edges in images.